The love story of Waylon Jennings and Jessi Colter changed the world of outlaw country forever. From their 1976 album, Wanted! The Outlaws to their series of No. 1 hits together, this duo was unstoppable. Although there will never be another duo like theirs, their legacies have lived on through their children and grandchildren. Before meeting Jessi, Waylon was already the father of five beautiful children: Terry Vance, Julie Rae, Buddy Dean, Deana, and Tomi Lynne. Jessi also had one daughter, named Jennifer. In 1969, Jessi and Waylon met and quickly tied the knot. Following their move to Nashville, the couple had their only son together, Shooter. From that point on – one legendary family was born. Waylon’s kids, all the way down to his grandchildren have followed in the singer’s footsteps in one way or another. Waylon’s oldest, Terry, had one boy of his own, Whey Jennings, who has been carrying on his grandfather’s legacy for years. His love for music began when he was just a little boy. Whey got ahold of his grandma Jessi’s microphone and ran out on stage to sing. Waylon chased after him and helped finish out the song – leaving the crowd (and Whey) in awe. With Jenni playing the piano and Whey standing beside her, the two mesh their vocals together for some impressive harmonies. Not many have heard Jessi’s daughter, Jenni sing and turns out, she adopted some of her mom’s golden pipes. As for Whey – his deep-rooted voice was the perfect match for the duet. 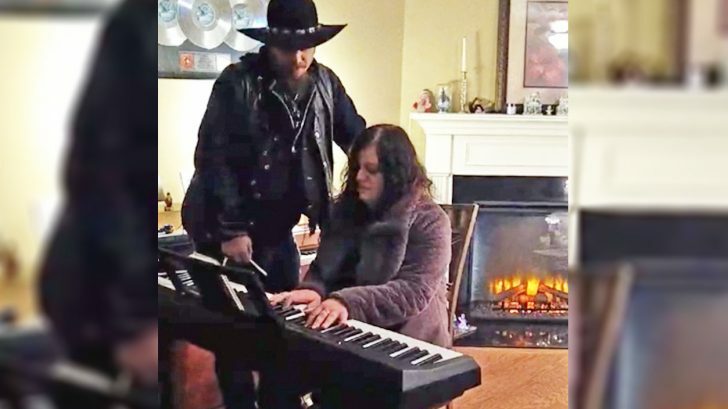 Although no one will ever sing the song quite like Jessi and Waylon did, we’re thrilled to see their children and grandchildren living out their legacy! Check out Whey Jennings and Jenni Eddy Jennings’ duet below.